Located in the Fort Worth Basin and covering approximately 5,000 square miles of north-central Texas, the Barnett represents the grandfather of shale reservoirs where the necessary set of technologies were developed to make hydrocarbon extraction economically feasible in shale. These technologies include horizontal drilling and multi-stage fracturing, which together have allowed for economic exploitation of this very tight gas reserve (<0.0005 mD permeability and 3 to 5% porosity). A number of fracturing methods have been attempted in the Barnett Shale, including open hole, single-stage “Hail Mary” fracturing; cemented liner, limited-entry fracturing; cemented liner, multi-stage fracturing; and open hole, multi-stage fracturing systems. 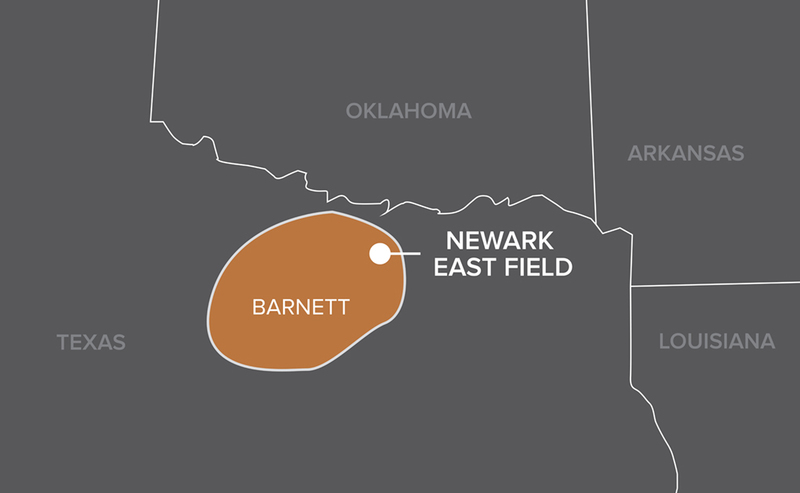 An operator working in the Newark East Field in the core area of the Barnett Shale had used the conventional cemented liner “plug-andperf” method to multi-stage fracture its horizontal wellbores. Due to the numerous operations and equipment required for this method, the operator sought a more effective multi-stage fracturing solution. The operator’s goals were to reduce costs, simplify the completion process, and eliminate long standby time during fracture treatments. The hope was to at least maintain equivalent well productivity achieved with the conventional cemented liner, plug-and-perf methodology. Between 2004 and 2006, the operator chose to run Packers Plus StackFRAC® systems to complete its wells in Denton County, Texas. StackFRAC is an open hole, multi-stage fracturing system that uses hydraulically-set, mechanical RockSEAL® II packers instead of cement to isolate sections of the wellbore and FracPORT™ sleeves to create openings in between the packers for fracture treatment. Size-specific actuation balls are injected into the system to allow for the hydraulic opening of the FracPORT sleeves. The balls create internal isolation from stage to stage, eliminating the need for bridge plugs. The major advantage of the StackFRAC system is that all the fracture treatments can be performed in a single, continuous pumping operation without the need for a drilling rig, saving time and costs. Once stimulation treatment is complete, the well can be immediately flowed back and production brought on line. The StackFRAC completed wells achieved the operator’s goals by eliminating 2 weeks of completion operation time for a savings of $300,000 to $400,000. An unexpected benefit of the StackFRAC completions was a dramatic reduction of excessive fracture initiation pressure, as high fracture gradients are a characteristic of shale rock. On earlier cemented liner treatments, it was common that some hydraulic fracture treatments could not be initiated on some stages, simply due to excessively high breakdown pressure. Long-term production from StackFRAC completed wells was compared with all non-vertical wells in Denton County completed from 2004 to 2005. Up to 60 months of production from over 200 wells were evaluated. Cumulative 1-, 2-, and 5-year gas values were determined for each non-vertical well completed from 2004 to 2005 and then averaged to determine the production for the field at each time point. Similarly, cumulative production values were calculated for five StackFRAC wells and averaged for each time point. At each time point, the StackFRAC completed wells outperformed the non-vertical offsets for production increases of between 25% and 37%. Therefore, the StackFRAC completions accomplished all initial efficiency objectives and after 5 years of long-term production history, the additional benefit of improved production.